Antique Lighting: Carcel lamps , Moderator lamps, column lighting from The Drawing Room of Newport Antiques, Rhode Island: "Furnishings from Newport's Gilded Age". # 5116. 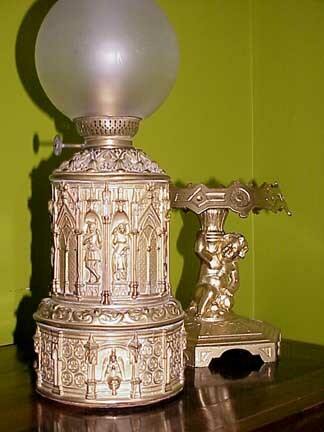 Pictured is one of a pair of 19th century Carcel Lamps in the Gothic Style. Mid 19th century. Size: 6" across; 16" tall to the top of the burner and app. 24" tall to the top of the chimney. The footed figural base is gold painted pot metal. The lamp is stamped brass. These lamps may have had mechanical interior works; they now function as kerosene lamps with a kerosene burner. We believe that they have been kerosene lamps for a long time. The matching glass ball shades appear to be period. The footed bases probably date from around 1870 while the lamps themselves date 20 years earlier. The lamps have tin fitted base covers while the rest is stamped brass. This is a very rare decor for a Carcel lamp. Country of origin, probably France. Price $3,500.00 the pair. # 4474. A Pair (2) of 19th century Charles X Column Lamps. Fitted for electricity. Bronze (dark and gold patinations). Size: 22" tall to the base of the contemporary electrical shaft. Condition: electrified and missing the clock work mechanism, the burner collar and the shade holder ring. This pair is unusually high style because of the four baccus heads joining around the center of the lamp. Price for the Pair is $11,000.00. # 2149. A Rare Charles X Column Lamp. Fitted for Electricity. 25.5" tall to the base of the electrical fitting. Retains its burner collar and shade ring. Good original patina with dark bronze and fire gilt surfaces. Probably French. Unmarked. The Column Lamp is a very elegant form of lighting, usually fitted with a mellon or ball glass shade. Price: $5,500.00. # 2084. A Charles X Rococo designed Carcel, Column, Oil Lamp. Condition: fitted for electricity and the burner element and shade ring is missing as is the inner clockwork mechanism and inner tin lining. The material is bronze: patina loss and minor corrosion. Size: 19.25" to the base of the electrical socket. These lamps are rare and when they were produced were costly: Thomas Jefferson had a pair of Column Lamps on his parlor mantel. They were rare and prized possessions for the most prominent families at the time. Price: $2,500.00. # 3516. A Single Charles X Column, Carcel Lamp. Size: 20.5" tall to the base of the electrical fitting. Condition: this lamp had its mechanical workings removed with it was electrified. It retains its key winding hole (that is where the electrical cord enters the lamp) and its tin box base. Marked with a makers name plate on the base: "Careau inventeur brevete". Original worn patination. 19th century. Price: $2,500.00. # 4559. A Charles X single Carcel or Column Oil Lamp. Bronze patinated in gold and dark patina. Size: 21.5" tall. Condition: The lamp has it's mechanical works, the spring wound motor that pumps the oil to the burner; the burner is missing as is the burner cage and shade ring; it has been fitted for electricity by simply running the wire up the shaft without really hurting the integrity of the mechanism. Could be reconverted back to oil will little effort. This rare lamp is French and is so marked by the firm of Dardonville and Sons - Paris as incised on the mechanism along with numbers. Price: $4,500.00. # 3081. A Single Carcel Lamp. Paris Porcelain with fire-gilt bronze metalwork. Fitted for electricity (mechanical innerworkings removed and burner/shade holder removed). Style: Neo-Grec. Fitted as a lamp before 1870. We attribute the porcelain vase to the firm of Denuelle, circa 1834. Copied in the Etruscan style. In 1834 Denuelle exhibited some of these Etruscan vases. Vases showing the same influence were reproduced by Stephane Flachat's work on French industry, along with the porcelain of Jacob Petit and Clauss. A similar styled vase was given by Mme Denuelle to the Musee Adrien Doubouche. Condition: the lower porcelain section has an apparent crack from the upper edge to the intermediate gold band. Minor surface wear consistent with use and age. This is a rare lamp depicting Greek figures, four in all. The predominant ground colors are turquoise, terra-cotta with black and gold tracery. There are three separate porcelain section joined with fire gilt bronze elements. Unmarked. The main image depicts a soldier / warrior atop a winged horse / Pegasus / killing a mythological monster. This high quality lamp would have been used in a room of furnishings consistent with cabinet makers such as Pottier and Stymus, Leon Marcotte, Herter Brothers and Alexander Roux. Size: 20" tall to the bottom of the modern electrical socket and the base has a 6" footprint. Price: $3,500.00.